This species is accepted, and its native range is SW. Thailand to Malaya. All states except Perlis and Malacca. ? Sumatra, Borneo. Clustering rattan varying from almost stemless rosette plants to plants climbing to 5 m tall. 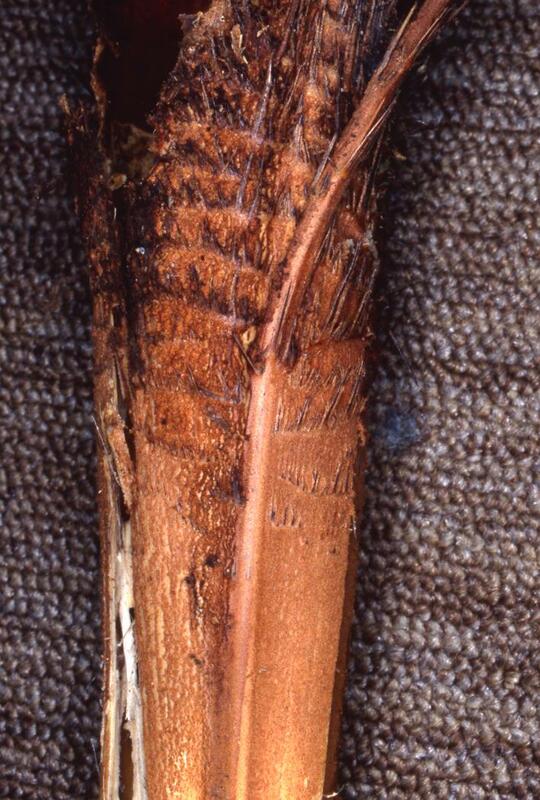 Stem without sheaths to 3.5 cm, less in climbing forms, with internodes 5-10 cm long. 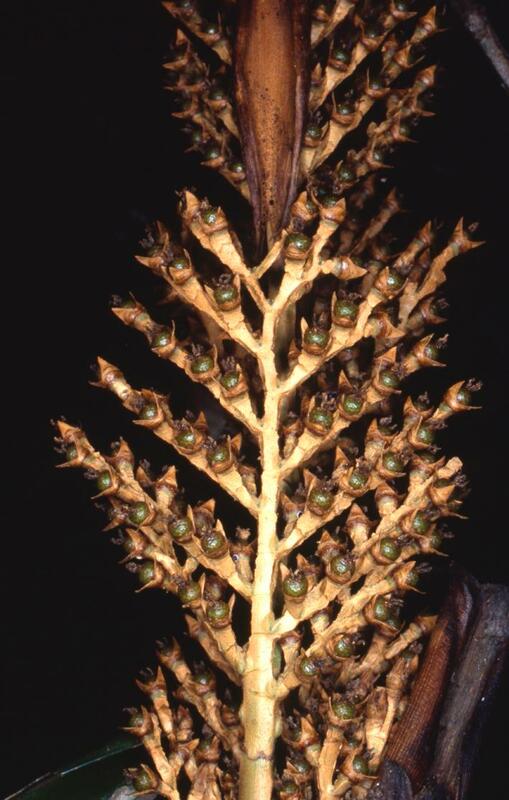 Sheath dull brownish green densely covered with reddish brown or dull dark brown indumentum and armed with dark brown to blackish spines to 4 cm long some erect, some reflexed, borne in oblique or horizontal partial whorls, the larger thorns frequently inter-sperced with much smaller spines. Knee absent in non-climbing forms. 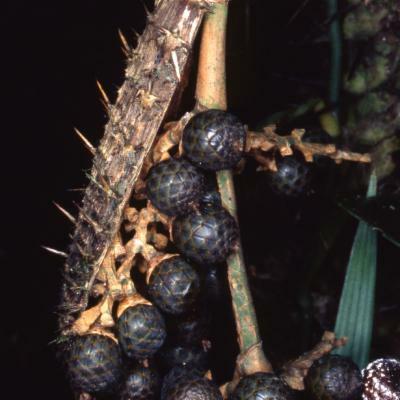 Spines around leaf sheath mouth usually erect and much larger than the other spines. 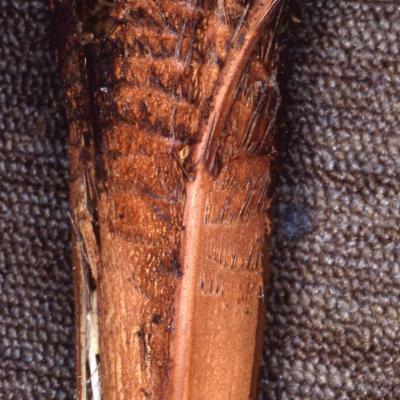 Leaf shortly to longly cirrate, in extreme small forms ecirrate; petiole up to 1 m long armed with lateral spines. 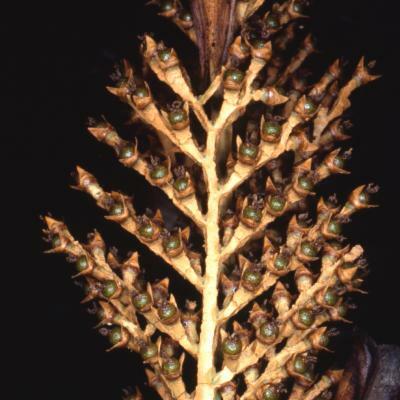 Leaflets about 65 on each side of the rachis regularly arranged, rather stiff, to 35 cm by 2.5 cm wide, armed with brown bristles to 5 mm long on 3 nerves above, and only on the mid-nerve below. Inflorescences male and female superficially similar borne on a spiny arching peduncle to 50 cm long (less in climbing forms). First bract densely spiny, persistent. Partial inflorescences crowded, each to about 10 cm long. 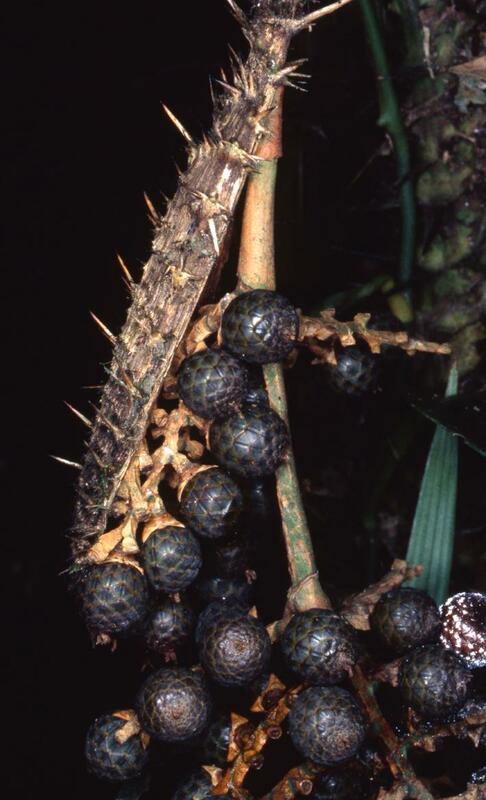 Mature fruit rounded, to about 1.8 cm in diameter, very shortly beaked covered in 15-18 vertical rows of rich brown scales. Seed rounded to 1.2 cm in diameter. Endosperm deeply ruminate. Seedling leaf with 4-6 equal leaflets. Not used except for thatch by Orang Asli.